I never know how to take it when a game puts its influences front and center. When the Kickstarter pitch for Oscar Brittain’s Desert Child casually listed Cowbop Bebop, Akira and Redline as touchstones for its frenetic hoverbike racing, it immediately gestures toward a shared theme – speed, speed, and more speed – but it also trades on the prestige of those iconic properties. If this videogame has great taste, then so do the consumers that buy it, am I right? Of course, these influences don’t have to be so cynically deployed and a game can certainly be referential like any other aesthetic work in the service of homage, but if the elements of that homage fail to come together into a compelling whole, the result is one empty reference after another. Thankfully, Desert Child backs up its namedropping with some substance. Stylistically, at least one influence is clear. Cowboy Bebop’s transposition of high tech wonder into low places and hard times is a clear inspiration for the game, but Desert Child’s most effective allusion to Watanabe’s masterpiece is the fantastic soundtrack, which is mostly composed by Brittain himself. The songs not only incorporate callbacks to specific beats from Yoko Kanno’s work in Bebop, but they replicate the adventurous spirit found in Bebop’s eclectic mixture of disparate styles, from solemn trumpet jazz marches to lo-fi hip-hop and other dips into unexpected musical genres. This dizzying variety of tunes decorates an old-school art style that clearly owes a debt to cinematic platformers like Flashback and Another World, as well as point-and-click adventure games. 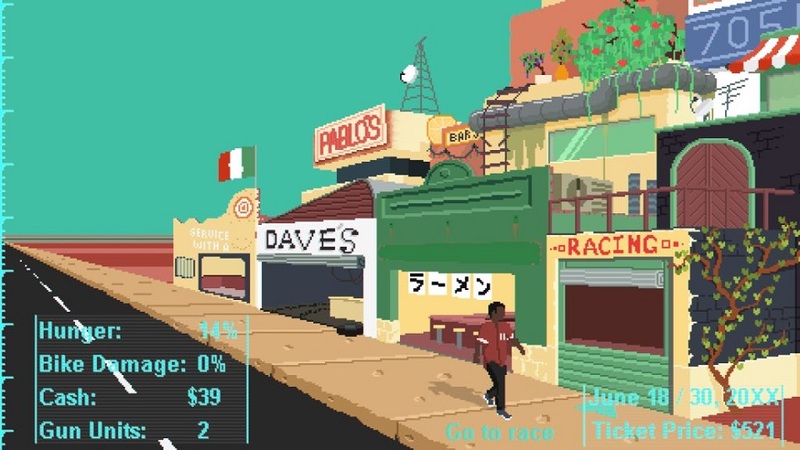 When the player isn’t racing, they’ll be wandering around the various areas to repair their hoverbike or grab a bite to eat, and each neighborhood has distinct camera direction — distant overhead shots for seedier downtown districts, tighter ground shots that only show the main character’s shoes as they walk by a hard-working hoverbike shop. This camera work, as well as the animations of various bystanders walking around town, does a better job of establishing a sense of place than the quirky exposition from NPCs. As for the story itself, there’s barely enough of a premise in Desert Child to stitch together the game’s three acts. The main character is a down-on-their-luck hoverbike racer who’s scraping by on a future Earth until he’s invited to go to Mars and race in the Grand Prix for fame and fortune. The first act on Earth, which effectively serves as a tutorial, drives the player towards Mars where the second act – and most of the game – is spent raising money for the Grand Prix entry fee. When the player finally makes it to the Grand Prix, all that dynamic camera work is traded for a jarringly static menu to select races — honestly, it feels unfinished. 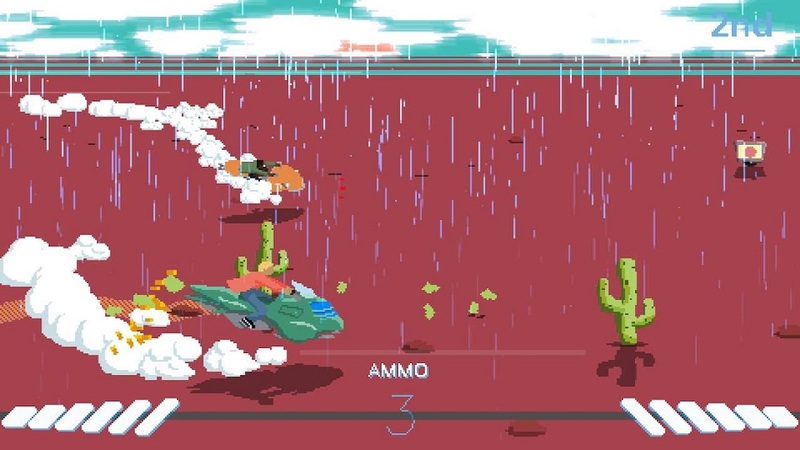 The money to make it from one act to the next is raised through missions that are all variations on the core racing engine, which is closer to a side-scrolling shooter than a typical racer. 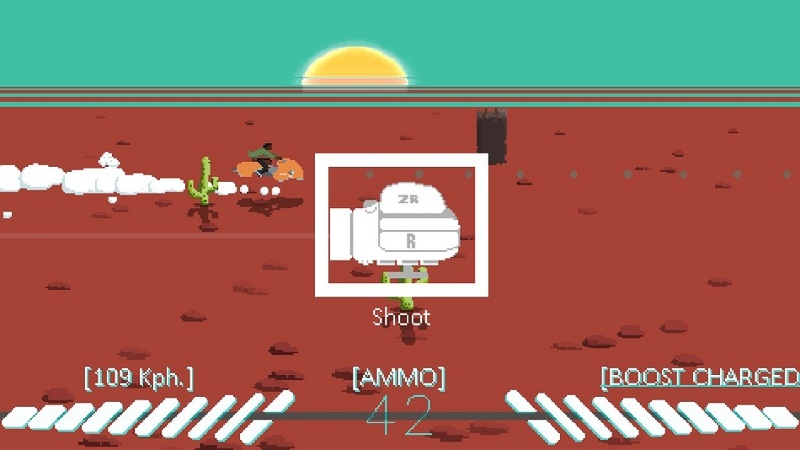 Players are armed with one of a handful of guns chosen at the start of the game, each with different rates of fire and spread. 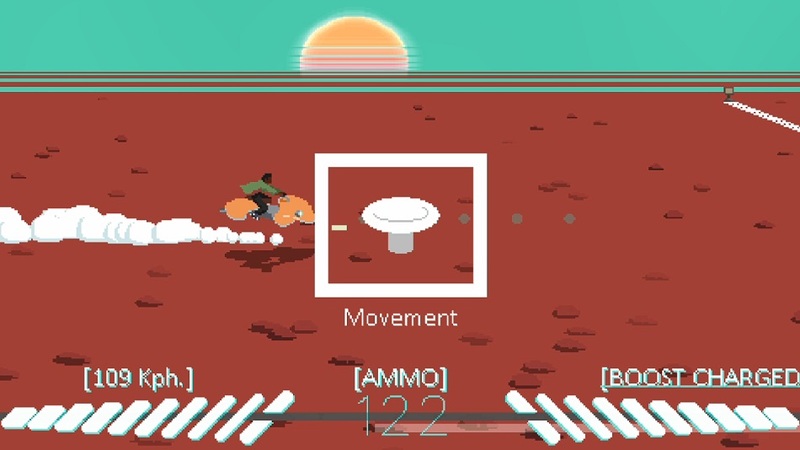 Gunplay, however, isn’t quite as important as managing the hoverbike’s boost, which can be used to burst forward or even side-to-side to destroy items on the track for money or ammo. There aren’t any curves or hills to navigate, and there’s not a lot of value gained from shooting opponents to slow them down, so most of the one-on-one races tend to come down to carefully timed boosts used to fly into first place right before the finish line. This makes the races feel momentarily evocative (and perfect for sizzle reels) but strangely unsatisfying after only a few runs. 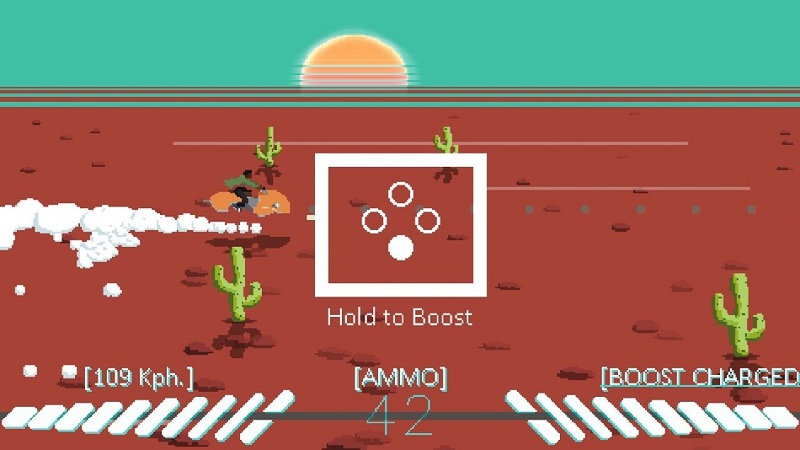 Desert Child does try to mix these missions up with different themes, but their success is typically reliant on how well they line up with the music. One memorable mission focuses on shepherding cows in a bit of a callback to Activision’s Stampede on the Atari 2600, complete with an offkey country guitar twanging away. 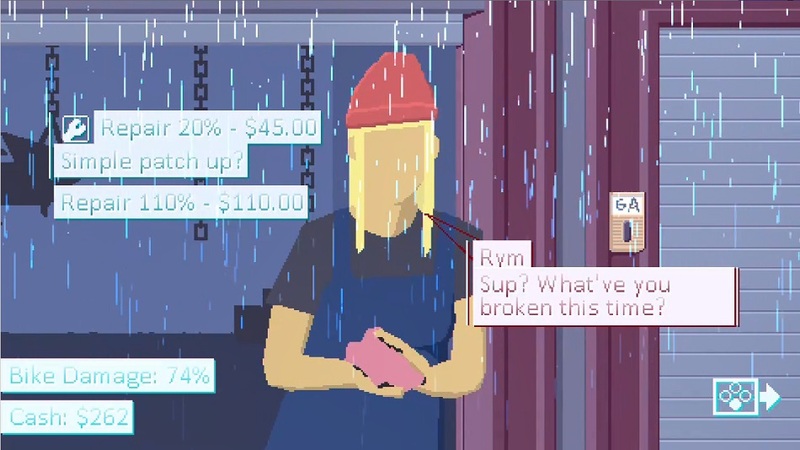 Another clever mission requires the player to fling boxes of pizza at high speed while a deliciously hokey surf rock jingle describes the virtues of the world’s fastest delivery service. There are also endearing bits of flavor to be found outside of play — there’s a sly joke at America’s expense found by swapping around some language options in the settings, and a dedicated “CHILL” button that displays a screen saver where the main character simply lays back on their bike as the sun sets behind. These little subversions show a glimpse of a developer that can still make an interesting game through flavor and tone, even if the underlying mechanics don’t necessarily reward deeper play. Disclosures: This game is developed by Oscar Brittain and published by Akupara Games. It is currently available on PS4, Switch, XBO, PC, Mac OSX and Linux. This copy of the game was obtained via publisher and reviewed on the Nintendo Switch. Approximately 4 hours of play were devoted to the single-player mode, and the game was completed twice, along with 1 hour of local multiplayer. Parents: According to the ESRB, this game is rated M and contains Sexual Themes, Strong Language and Use of Tobacco. There is no official ESRB description for this rating, but I can confirm that there is frequent profanity in NPC dialogue as well as some of the options at the opening menu screen of the game. 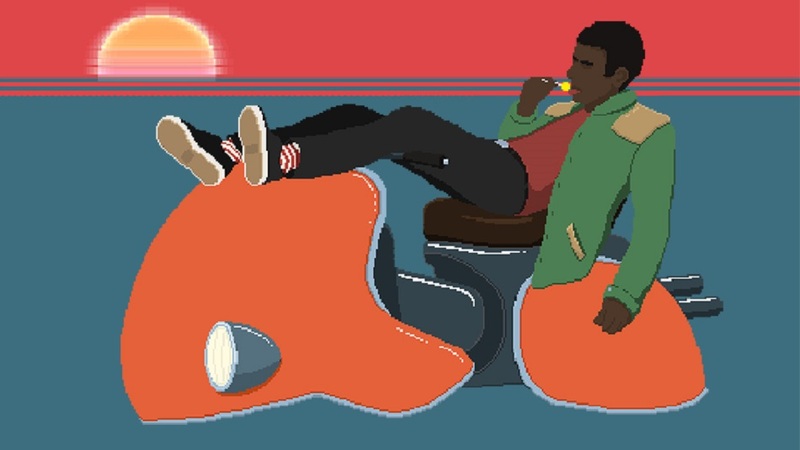 The main character smokes a cigarette during the “CHILL” screensaver that players can activate, and players can also purchase cigarettes or a drink of whiskey at various points from NPCs. Colorblind Modes: There are no colorblind modes and, frequently, critical menu text is displayed in light blue text on white backgrounds. Remappable Controls: No, this game’s controls are not fully remappable, nor are there any diagrams in-game showing the controls outside of the initial tutorial race. The official Gamepedia entry for Desert Child also has some instructions for basic controls.